The celebrated author and journalist joins us today at noon EST to discuss "The Hunting of Hillary." As I wrote earlier this week, Armando hosted a Daily Kos interview with Joe Conason, one-half of the investigative team that wrote "The Hunting of the President." Now he and Gene Lyons have released "The Hunting of Hillary" (available as a free download) and Joe will be here at noon talk about the book -- and the never-ending media distortions about the Clintons. Have your questions ready! Joe Conason, the editor in chief of National Memo, and who, with Gene Lyons, wrote the seminal book about the media's bizarre crusade against Bill Clinton, The Hunting of the President (also in documentary film format), is a man for the moment, given the media's second wind in applying the Clinton Rules. And he is stepping up, penning a new e-book with Lyons titled The Hunting of Hillary (It's FREE! ).Conason was kind enough to give us a few moments to talk about the media and the Clintons, surely one of the strangest stories of the last 25 years, as discussed below. So Joe, do you feel like you got in a time machine and traveled back to 1992? I know I check to see if Howell Raines is back on the New York Times masthead. An uneasy sense of déjà vu comes over me when reading some of the Times coverage, I’m sorry to say. 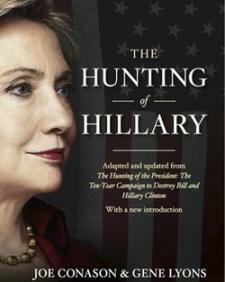 It is troubling to see the Times—still the best and most important American newspaper—continue to publish hostile, unfair, and inaccurate articles about the Clintons, both Hillary and Bill.In the new introduction to The Hunting of Hillary, Gene Lyons and I discuss how the current spate of “scandal” coverage fits into a pattern that began 20 years ago. We used to think that Howell Raines and William Safire were principally responsible for the obvious bias of Timescoverage of the Clintons, but Safire is dead and Raines is retired. To what degree do you see the Times as leading the Hunting for Hillary charge? In the '90s, the smearing started from right-wing sources—the American Spectator and their Arkansas Project and the like. But this cycle it seems the Times has decided to be the main outlet for the smears. Actually, the Times has played an unfortunate role in the media "hunting" that dates back to the very beginning of Whitewater—as we explore in The Hunting of Hillary. Right-wing forces, including those behind the Arkansas Project, were determined to bring down President Clinton from the start—and in fact, some of them worked with Jeff Gerth, then a Times reporter covering Whitewater. Gerth's cooperation with them is a stunning fact that has gotten far too little attention over the years, but one that we report and analyze closely here.Now we are seeing the same old process repeated: Reporters at the Times are leading the assault on Hillary Clinton, with inaccurate stories and slanted leaks from House Republicans on the Benghazi select committee, to cite the sorriest example. Then Fox News and the rest of the right-wing noise machine amplify those erroneous stories, along with much of the mainstream media, which still tends to follow the lead of the Times. That was exactly the pattern during the ‘90s, when the Times first gave its imprimatur to the bogus Whitewater "scandal" as if it were another Watergate—and came to rely heavily on leaks from Independent Counsel Kenneth Starr. The Times was not alone in that vein of scandal coverage—many other media outlets were equally culpable. You and Gene Lyons, of course, wrote the seminal book, The Hunting of the President, about the campaign against Bill and Hillary Clinton. Is the e-book a first draft of the second volume, but this time about a possible President Hillary Clinton? As the 2016 campaign approached and it became clear that Hillary Clinton would run for president again, Gene and I decided that the reporting and analysis in The Hunting of the President remained highly relevant—and that many voters would be unfamiliar with that story, which was first published 15 years ago. So we created a new e-book, which condenses our original book into a shorter version focused on Hillary Clinton—and courtesy of our publisher, St. Martins Press, we are providing this new version free of charge to anyone who wants to read it. JOE CONASON is editor-in-chief of The National Memo, the online newsletter and website that he co-founded with his wife, Elizabeth Wagley, in 2011. He also serves as editor-at-large of The Investigative Fund at The Nation Institute, where he oversees award-winning reporting projects that appear on a wide variety of print, online, and broadcast platforms.